Below are some terms you may see used in my blog so I thought I would offer some explanation to help others understand what they were reading. Enjoy. Experimental Aircraft - Did you know that a full 10% of the general aviation aircraft flying in the USA are "experimental?" This equates to many thousands of aircraft. The term "Experimental" is an often mis-understood term that conjures up visions of those black and white movies of the early days of flying with those crazy looking contraptions. In fact, an aircraft is designated as experimental simply because it is not "certified" by the FAA. In other words, it was not built by a manufacturer who has worked with the FAA to certify that the design and manufacture meet specific FAA requirements. Examples of experimental aircraft include WWII warbirds, air racers, and my specific interest...Experimental Amateur Built (EAB) Aircraft like the Cozy, Long EZ, RV series, Lancair, Glassair, Kitfox, and many many more. Although there are some one-off designs, most people build an already proven design that has detailed plans or instructions to follow and although not "certified" by the FAA, are completely safe, in some cases arguably safer, when built correctly, with respect for the design, and flown within it's design limitations. Plans Built - Refers to one way to build an Experimental Amateur Built (EAB) aircraft. Many types are available in kits, like the RV series, Kitfox, Glassair, etc. These kits usually contain many pre-fabricated parts that are assembled into the resulting airframe. Plans built aircraft, as the name implies, are primarily built from a set of plans and materials. There are some pre-fabricated parts available like the gear legs and small metal parts, but not many. 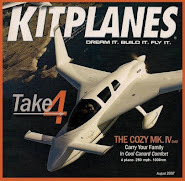 The key difference between kits and plans built aircraft is that with a plans built aircraft the airframe is built from parts you the builder must first fabricate yourself...in the case of the Cozy, using composite fiberglass construction. Canard - Refers to a specific aircraft design where the horizontal stabilizer and elevator, the part that is normally in the back, is moved up front ahead of the main wing. It also refers to the horizontal stabilizer itself when on a canard designed aircraft. Canards are not new...in fact the Wright Flyer was actually a canard aircraft. Burt Rutan is responsible for making them a popular homebuilt aircraft. The advantage of a canard aircraft is in it's increased safety from stall-spin accidents. In this configuration, the elevator will stall (lose lift) before the main wing, thereby lowering the nose and reducing the angle of attack to a flying configuration again. This way the main wing theoretically can't stall and so your risk of a spin is almost non-existent. Composite - Refers to a type of construction where different materials are laminated together to form a much stronger end product than either individual material could be on it's own. In the Cozy, various kinds of foam are bonded between layers of fiberglass. The result is a super strong but also very light weight part. The Cozy uses "moldless" composite construction where, you guessed it, no molds are used to shape parts. It's all done by hand and sometimes with a jig which you also must first build. Foam - Similar to Styrofoam but with different structural properties. The Cozy plans call for several different types of foam, each with it's own unique properties, to use as core material for the composite construction. Epoxy Resin - Epoxy resin is a two part mixture (resin & hardner) which when mixed together in the correct ratio, create a strong adhesive. Epoxy is what's used to make the fiberglass parts. Not all epoxy is equal. For aircraft building you must use epoxy suited for structural composite work. Fiberglass Cloth- Fiberglass actually comes on a roll like any other cloth like material. It's made up of fine strands of glass woven into a structure. When the cloth is soaked, or "wet out", with epoxy resin and allowed to cure, you get the hard fiberglass everyone is familiar with. There are two primary types of glass used in Cozy construction depending on what forces the part is expected to encounter. BID Tape - Refers to 2" wide strips of BID glass cloth. These tapes are used across the joint between two parts...like where a bulkhead intersects with the fuselage side. The tape provides reinforcement for the joint and helps make the joint look much smoother. Micro - Micro is short for "micro-balloons" and refers to an epoxy mixture that includes some amount of these very fine plastic balloons. They are so small, a bottle of micro-balloons moves like water when swished around. Micro is primarily used in a thick syrup-like consistency for filling the pores of the foam before putting glass cloth on it. It helps create more surface area for the glass to hold to and is lighter than straight epoxy since it has the micro-balloons in the mixture. It is also used in a thicker consistency, "dry micro", for filling dings and holes in foam before glassing. Flox - Refers to an epoxy mixture that includes some amount of flocked cotton. Flocked cotton kinda looks like snow. Adding this to the epoxy mixture adds structure for bonding one part to another. Plain epoxy, without something like glass cloth or flocked cotton to provide structure, is actually pretty brittle. I think that about covers what you need to know in order for my posts to make sense...hopefully. Let me know if you find something you think should be added to the list.